The Bernese Oberland Ski Tour traverses the premier high altitude ski touring region of the Western Alps. On this varied and challenging week, we take in some of the finest ski summits in the region, culminating in the famous 2000m descent down the Lotschental at the end of the tour. This is a popular classic aimed at skiers looking for big glacial scenery, great ski summits and plenty of long descents, with the added bonus of some great huts! We had one of the best touring trips I can recall. It was not just the weather, which was exceptional, but the Oberland is magnificent and I liked the way we were able to spend more than one night in each hut. Al’s guiding could not be faulted. He got our measure quickly and paced us appropriately. Snow conditions are not just a matter of luck but of being in the right place at the right time and Al was spot on here. I will certainly be back for more. Definitely another skitouring trip next season but possibly some climbing in the summer too, if I can get the time off. Many thanks and best wishes to you both. Thanks for your email. We had a fantastic trip – very well organised, exceptional snow and sun, and Al paced us well, with great good humour. We made it down in one piece (though our skis nearly didn’t) and still smiling…A definite success! Thanks to you both and best wishes for a good rest before the summer season gets in full swing. Just like to say a big thank you for the trip, we certainly saw the wilderness of the Bernese Oberland. The professionalism and leadership shown during the trip is what you expect from a Guide but it’s always impressive especially given the navigation on Thursday on the glacier, partly in white out, amongst the crevasses and all with a broken ski, what a star! The Oberland trip was a great success. In particular, Kenny was an excellent Guide – good humoured throughout, very effective at managing the group and the individuals, highly professional. The itinerary was very well designed and well balanced (and fortunately we had settled weather to make the most of it!) 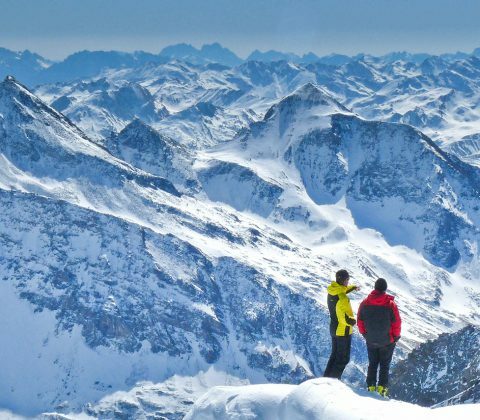 – covering a good amount of ground to make it a real tour, and including some fine skiing peaks including 2 above 3900m. The terrain offers flexibility in terms of objectives and is a reliable place to tour in all weathers – as various routes are possible through the range. Two nights are spent at a couple of the huts, allowing lighter packs on some days. This is an intermediate level trip. To take part you should be at Fitness Level 3 and Tech Level 3 (see our Fitness/Experience guidelines below). You need previous multiday ski touring experience in order to join this tour. The week involves continuous 6 hour days and some big (1000m+) climbs, so you can expect to be skinning for 3-5 hours a day. Type of ascent: we use 30% uplift and 70% skinning – approx 5300m skinning up (all at altitude), and 6700m skiing down on the tour. 2 nights hotel accommodation in Brig including breakfast. 5 nights accommodation in mountain huts, including breakfast and 3 course evening meal. Our meeting point for the Bernese Oberland Ski Tour is the Hotel Europe*** in Brig, which is just 80m from the railway station in the centre of town. Rooms are provided on a twin (or occasionally triple or quad) sharing basis, but if you wish to book a single room please let us know and we will confirm availability. Any extra luggage can be left until in the hotel until your return to resort at the end of the week. Evening meals can be taken in Brig. Hotel details can be found on our Accommodation page. For overnights in the high mountains we will use mountain huts. This tour uses modern and super efficient Swiss huts in the heart of the Oberland’s huge glacier systems. For more info please read the Using Alpine Huts article which provides an overview of typical facilities, average costs to help you budget for lunches/drinks, and general info on hut etiquette. You should arrange outward travel on Saturday, arriving by 5-6pm latest in time for the briefing at your accommodation. Your guide will run through kit checks and safety routines, as well as hand out any rental equipment, before going on to discuss the current weather and mountain conditions and how these affect our plans. We’ll have maps and guidebooks of the area to show you, so if you’ve any further questions or last minute requests, then this is the ideal time to bring them up. Overnight in the valley. Trugberg makes an ideal first day objective en route to the Konkordia Hut. After an early morning train ride round to Grindelwald, the Jungfraujoch Mountain Railway leads right up through The Eiger to 3500m. Along the way there are several opportunities to view the famous North Face – first at Kleine Scheidegg, then again at the Gallery Windows where it’s possible to look right out across the face. From the top station, a steady skin across to the Monschsjoch serves as a good warm up, followed by a gentle descent down the Ewigschneefeld to where the main climb up to Trugberg begins. It’s a 500m ascent up to the shoulder and depending on conditions it may be possible to do the final boot track up to the ski summit. The classic descent off Trugberg is via the South Face however, so if it’s already warm it may be best to ski this straight away in order to find good snow conditions. The Konkordia Hut lies 2km away from the bottom of the main descent and a combination of gliding, poling and maybe a short skin finally reach the infamous hut steps. Due to glacial recession, these are getting longer each year, so it’s now quite a pull up to the hut at the end of the day! 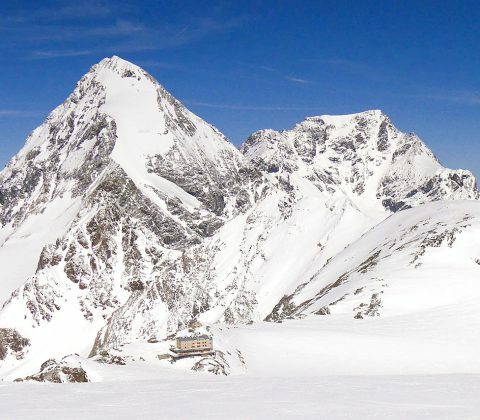 Kranzberg is a great ski peak and a classic day tour from the Konkordia Hut. After the initial steep slope up off the glacier, the main ascent is at a very steady angle, making for comfortable skinning all the way. At 3400m a shoulder is crossed, which leads to the final bowl up to the summit ridge. At the ridge there’s a ski depot, from where it’s just a short climb on foot to the top. The views out across to the Aletschhorn are stupendous. Back at the skis, it’s time to enjoy the descent, which is just the right angle for doing lots of long wide open pitches. Lower down, a series of little valleys lead to the final steep drop down onto the main glacier. Then it’s just a case of getting back across to the hut and up the steps (again..) for a well earned lunch. Wysnollen is often done in combination with a traverse of the Grunhornlucke en route to the Finsteraarhorn Hut. Athough on paper this looks like quite a bit of climb, it’s split into two very steady ascents – the first of which is done in the shade – so overall it’s not an especially long day. From the top of the Grunhornlucke a short descent leads down to the base of Wysnollen, where it’s time to double back and head up to the summit. This is another very even angled climb, leading right to the top on skis. The descent is particularly good after a dump of fresh snow, when there are a lot of good powder pitches to be had. The Gross Wannenhorn is one of the best ski peaks in the Bernese Oberland and a real must during any visit to the Finsteraarhorn Hut. The architecture of the mountain is simple – a long glaciated bowl leading to a broad summit ridge. It’s this that makes it such a good ski peak, as the whole of the climb can be done on skis, right up to the summit rocks. On the way down, it’s generally always possible to find good snow by carefully selecting different slope aspects depending on the current conditions. At the bottom, there’s just the final skin back to the hut where lunch and a beer or two on the terrace await.. This is primarily a mountain travel and relocation day – but we get one good descent as we retrace our steps over the Grunhornlucke and on down to the Aletschfirn, before a long easy angled skin up to the Hollandia Hut. 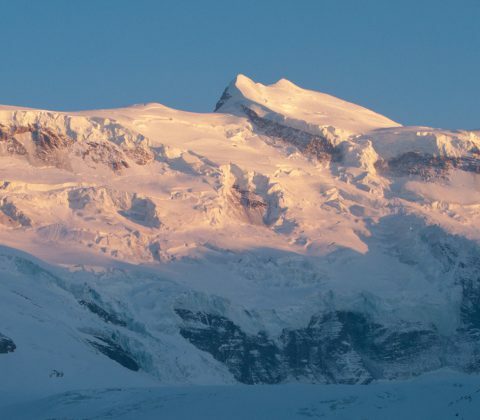 The route is obvious – just keep on skinning to the col – but the views are a great distraction from the effort, as we pass by the mighty North Face of the Aletschhorn – a 3 mile long, 800 metre high wall of rock and ice that dominates this part of the Oberland. 800m ascent, 600m descent ~5-6hrs. At nearly 4000m, Abenifluhe is the highest peak in the Bernese Oberland that can be easily skinned to the summit of. This makes it one of the finest viewpoints in the range and a perfect place to start the final long run at the end of a weeks touring. The ascent from the Hollandia Hut isn’t too long and it’s set at an easy angle for most of the way – ie two other bonuses at the end of a hard week! The initially the descent returns down past the hut, before crossing the Lotschenlucke and plunging 2000m down into the Lotschental. This is one of the most beautiful valleys in the Alps and finally leads to the road head, where a post bus takes us down to the railway station and back to Brig. PM return to Brig via train and postbus. Return travel should be arranged from Brig on Saturday morning, after your final nights accommodation. The other classic way to ski out of the the Bernese Oberland is via the Vorder Galmihorn, heading down to either Munster or Reckingen in the upper Rhone Valley. From either hut, the Vorder Galmihorn can be climbed by skinning up the north face and onto the ridge, which leads to an amazing summit viewpoint. A choice of excellent descents are possible, either going straight down to Reckingen, or skiing down past the Galmihorn Hut to Munster. A third, slightly shorter route avoids the climb up onto the Galmihorn by traversing through the Galmilicke instead. Early in the season or in a good snow year, it’s possible to ski right down to the village.